The highlight of our weekend was taking Sunny to the Dog Park! The weather reached the fifties which is quite unheard of in Minnesota in January. We're not complaining. We love Global Warming at our house. Sunny was so happy to go because he's been cooped up and cranky for most of December. He had a lot of pent-up aggression to unleash. It's funny how he always gets frisky with smaller dogs instead of with bigger ones like the two great danes behind him. When the weather gets above freezing, we have a favorite game we like to play. We sneak up near vehicles that are out parked on the ice and get as close to them as we can. 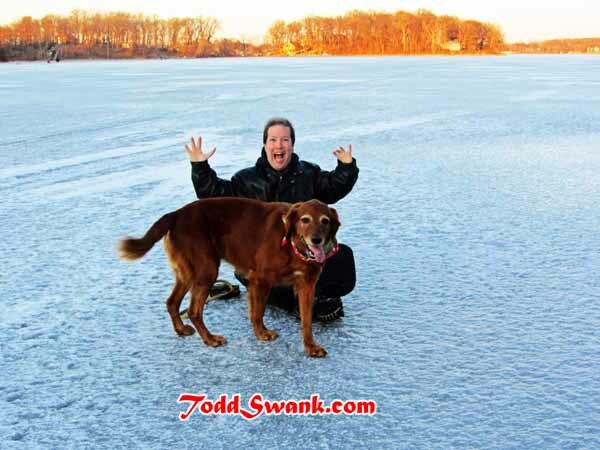 We figure that our extra weight just might be enough to get them to fall through the ice! We haven't made it happen yet, but are guessing the results will be hilarious when we do!